AWSM theme comes with 10 page templates which you may use on your website. To create a page, go to Pages -> Add New link, then look on the right side of the screen for template selection. 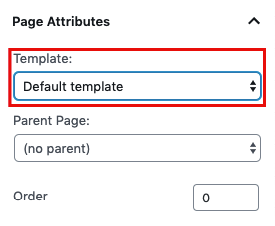 Default Template – This is the default page template with no custom functionality included. It only displays page content with right sidebar. Blog Template 1 – This is a blog page template which displays a list of your blog posts. Featured image has full content width, post title, and content display below. It also displays blog sidebar on the right. Blog Template 2 – Date box on the top, aligned with the featured image. The post title is below. Right blog sidebar is included. Blog Template 3 – Date box and title on the top, with the featured image below. Right blog sidebar is included. Blog Template 4 – This template list your posts in a full-width timeline view. No sidebar included. Career (About) Template – This template list your career items in a full-width timeline view. You can also add any standard content to its page which will be displayed above the career timeline. Contact Template – This template is used to show your contact form and Google Map. You can edit settings for this template in the Theme Options, contact section. Full-Width Page Template – This is a blank page template similar to the default template. Instead of the content + right sidebar, it displays full with content with no sidebar. Perfect to combine columns and shortcodes described in the next chapter of this documentation. Portfolio Template – This template displays all your portfolio items and should be used as the main portfolio page. Check your Theme Options portfolio section for some extra options which correspond with this template. Profile (Home) – Template You will probably want to use this template as your landing page. Upload your personal image or logo as a featured image of this page and check some more options in Theme Options profile section. You can use shortcodes on any of this page templates. Shortcodes usage is described in the next chapter.